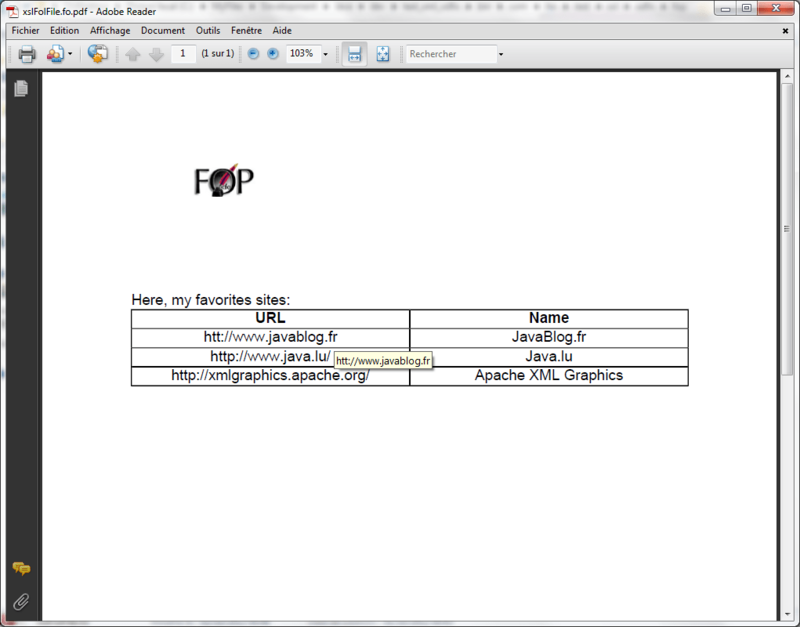 Here, a post to present briefly the recommandation XSL Formatting Objects (XSL-FO) and an example with Apache FOP. This article is a part of a serie of posts concerning the XSL recommendations. XSL Transformations (XSLT): a language for transforming XML; An XSLT stylesheet specifies the presentation of a class of XML documents by describing how an instance of the class is transformed into an XML document that uses a formatting vocabulary, such as (X)HTML or XSL-FO. XSLT is developed by the W3C XSLT Working Group (members only) whose charter is to develop the next version of XSLT. XSLT is part of W3C’s XML Activity, whose work is described in the XML Activity Statement. The XML Path Language (XPath): an expression language used by XSLT (and many other languages) to access or refer to parts of an XML document; XPath is developed jointly by the XQuery and XSLT Working Groups. XSL Formatting Objects (XSL-FO): an XML vocabulary for specifying formatting semantics. XSL-FO is now developed by the XML Print and Page Layout Working Group. XSL Formatting Objects (XSL-FO), defined in the W3C XSL recommendation, is a language of data formatting, i.e. a markup language based on XML that defines the layout of text, images, lines and other graphical elements. XLS-FO allows to create quality prints on paper or on screen. Contrary to XHTML / HTML, which is particularly suitable for browsers, XLS-FO is mainly used in the field of printing and archiving for documents with many pages. In 2001, XSL-FO was defined by the World Wide Web Consortium as a W3C Recommendation i.e. a standard language for converting XML documents in printing format. The fo:root element is the root element of XSL-FO documents. The fo:layout-master-set element contains one or more page templates. There are several implementations of XSL-FO processors, in this article, we will describe how to create a PDF document using XSL-FO and FOP developed by the Apache Software Foundation. // Note: Using BufferedOutputStream for performance reasons (helpful with FileOutputStreams). // The pdf is generated  in "bin" folder "test_xml_xslfo\bin\com\ho\test\xsl\xslfo\fop"
ATTENTION: Font "Symbol,normal,700" not found. Substituting with "Symbol,normal,400". ATTENTION: Font "ZapfDingbats,normal,700" not found. Substituting with "ZapfDingbats,normal,400". Note: The above screenshot contains hyperlinks. In this post, I have presented briefly the recommandation XSL-FO of XSL with the XSL-FO processor APACHE FOP to create PDF from XSL-FO stream. The bit of code will help you to create PDF programmatically.